Retirement account IRA’s and a IRA rollover can be used to transfer the money you’ve invested in one or more employer-sponsored retirement plans, keeping it tax deferred; if you leave a job or retire from one. This retirement investment does qualify for a self-directed IRA investment. Although CORI LLC does advise that every investor consult the proper professionals during the due diligence period. CORI LLC has investments yielding 8% that are secured by a hard asset; through a first position lien on real estate. Using an IRA rollover, you can transfer your retirement savings to an account at a private institution of your choice, and you choose how you will invest the funds. 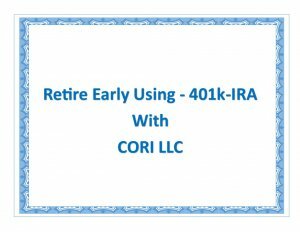 Using CORI LLC’s Retirement Investment and a IRA rollover, you transfer your retirement savings to an account at a private institution of your choice. You choose how you will invest the funds. To preserve the tax-deferred status of retirement savings, the funds must be deposited in the IRA within 60 days of withdrawal from an employer’s plan. To avoid potential penalties and a 20% federal income tax withholding from your former employer, you should arrange for a direct, institution-to-institution transfer for all retirement funds. This is the easiest way of avoiding a penalty. You are able to roll over assets from an employer-sponsored plan to a traditional IRA or a Roth IRA retirement plan. Because there are no longer any income limits on Roth IRA conversions, everyone is eligible for a Roth IRA conversion; however, eligibility to contribute to a Roth IRA phases out at higher modified gross income levels. Keep in mind that ordinary income taxes are owed (in the year of the conversion) on all tax-deferred assets converted to a Roth IRA. An IRA can be tailored to your particular retirement plan needs and goals, and can incorporate a variety of investment vehicles, as opposed to the limited number of options available in many employer-sponsored retirement plans. In addition, tax-deferred retirement savings from multiple employers can later be consolidated in one retirement plan. 3 ways to invest passively or semi-passively invest in today’s real estate market. Without losing your shirt or having to find great deals yourself for your retirement account.